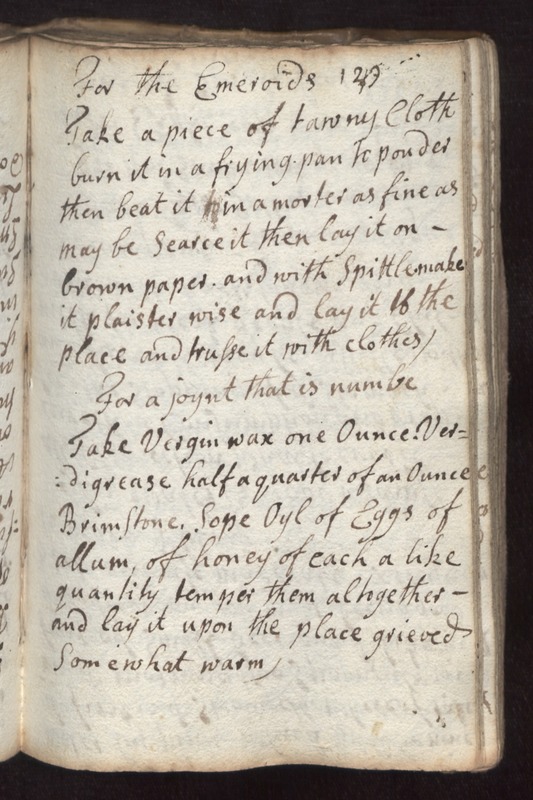 129 For the Emeroids Take a piece of tawny cloth burn it in a frying pan to powder then beat it in a morter as fine as may be searce it then lay it on brown paper ands with spittle make it plaister wise and lay it of the place and trusse it with clothes. For a joint that is numbe Take Vergin wax one ounce. Vergigrease half a quarter of an ounce brimstone, sope oyl of eggs of allum, of honey of each a like quantity temper them altogether and lay it upon the place grieved somewhat warm.